If you want to attract more people to your stand our trussing stand solutions provide a very professional eye catching design at a price equivalent to some shell schemes. Exhibition trussing systems, also known as gantry systems, come in many shapes and sizes and comprise a rigid framework that creates a temporary structure and can even be used outdoors. 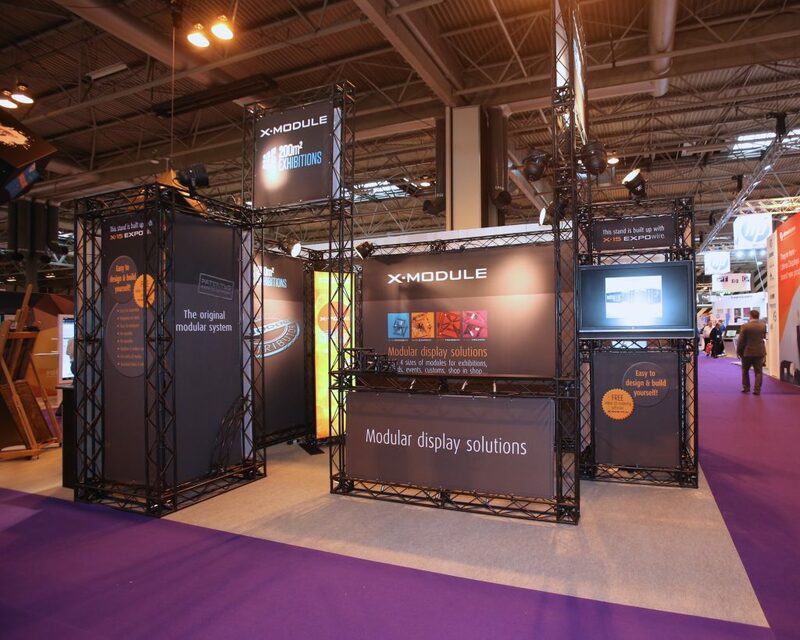 The strong lightweight modular exhibition trussing system is ideal for creating a visual impact at events and exhibitions. Use your trussing stand again and again in the same or different configurations, keeping your future exhibition costs to an absolute minimum. Our exhibition trussing system is simple to assemble – no tools required – means you’ll also save on both build and dismantle costs and your trussing stand will generally pack down into the back of most estate cars. The truss systems are lightweight and strong resulting in lower costs of transportation and storage than conventionally used exhibition materials. The strength comes from the aluminium inner tubing which is then covered with a strong injected moulded composite plastic. This finish gives the product a toughened exterior will show very little wear over the years. These exhibition trussing systems can also be used with a wide variety of components including plasma screens, lighting, shelving, reception tables and storage. From small display panels to large complex structures over two floors, exhibition trussing can be used to create extremely impressive exhibition stands. Flexibility is the main advantage as different lengths of trussing can be used to create structures in virtually any space. To reconfigure your exhibition stand to fit different areas simply purchase additional components to bolt on. If you want to rebrand or deliver a new message change your banners (£25 per square meter), you get a brand new stand design for a fraction of the cost. There are three sizes of trussing systems that can be used to build any size of stand and fit whatever footprint you require. The modular frame is easy to assemble and has attachable banners. 200m2 aims to bring simplicity, no tools, modular, versatile, easy to build and designing a vision!